The California Basketball Association (CBA) led by Commissioner Dr. Michael Miller, announced that Crenshaw High School located at 5010 11th Ave., Los Angeles, CA 90043 will be the site for the boys basketball semi-finals and finals. Dr. Miller excitedly announced the competing teams for the 2017 summer championship on Saturday morning June 24, 2017 as defending L.A. City Section Division 1 Champions Crenshaw HS led by coach Ed Waters; defending L.A. City Section Division 2 champions Gardena HS led by coach Ernie Carr; and the third boys team is L.A. City Section Division 4 runner-up Augustus Hawkins HS led by coach Tamao Kawai. The schedule of games at Crenshaw HS on Saturday morning June 24, 2017 starts with the first semi-final at 10 a.m. between Gardena HS and veteran former college coach Ernie Carr against coaching newcomer Tamao Kawai and his outstanding team from Augustus Hawkins HS from South Central Los Angeles. The loser of this game goes on to play Ed Waters and the famed Crenshaw HS Cougars in the second semi-final at 11 a.m. The winner of the second semi-final game plays the winner of the first semi-final at 12 p.m. for the championship. CBA Commissioner, Dr. Michael Miller is elated over the quality of teams and talent that will be on display in the Crenshaw HS gym. The girls basketball finals will also be held on June 24, 2017 and will be held at East Los Angeles College in Monterey Park, the California in the men’s gym. Games times for the girls site are 9:30 a.m., 10:30 a.m., 11:30 a.m. followed by the championship game at 12:30 p.m. The competing teams on the girls side are led by defending L.A. City Open Division champions Fairfax HS and coach Chuck Harrell. The field also features defending L.A. City Section Division 3 champion Torres HS led by Coach Walter O’Neal. Torres high school is located right around the corner from East Los Angeles College and comes into the event as the sentimental choice by the locals. Upstart Rancho Dominguez HS led by coach Box will be attempting to become the first small school to win the ladies crown in LA Watts Summer Classic history. Admission prices range between $5-$10 and are good for all games at both sites. 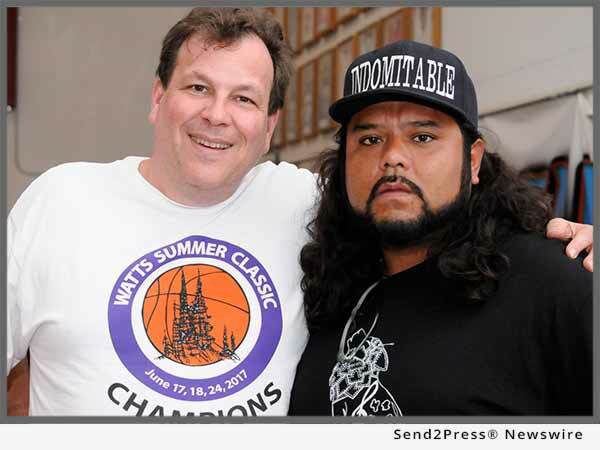 *Photo Caption: CBA Commissioner Dr. Michael Miller with Sotomayor head coach Jesus Fernandez at the LA Watts Summer Classic in Compton, Calif.
"This event is all about bringing people together from all of walks of life and from diverse areas of Los Angeles," said Commissioner Miller. California Basketball Association (CBA) is a premier Basketball League in Los Angeles formed to give players an opportunity to showcase their skills to overseas scouts. CBA is an exciting fast paced semi-pro basketball league for men and women. The season runs January to June with all games on Sundays in same location.